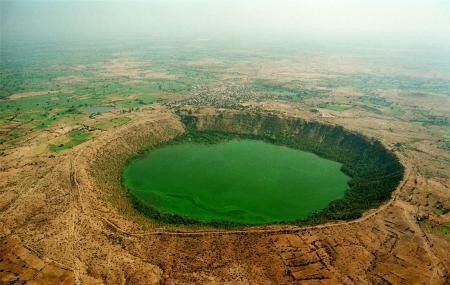 This is also known as the Lonar Lake or the Lonar Crater Lake and was formed from the effect of a meteor that had fallen down during the Pleistocene Epoch. This place lies in a Basalt structure and is both salty and alkaline. It is situated in the Buldana District of Maharashtra. The reference of this lake can be traced from the Skanda Purana, Padma Purana and also the Aina-i-Akhbari. It is proved through researches that this was formed almost 50000 years ago. There are numerous temples built around this lake, most of which are in ruins at present. The temples in a little better condition are the Daitya Sudan, which was dedicated to Lord Vishnu as a sign of his victory over the demon Lonasur. The other temples inside the crater are- Vishnumandir, Wagh Mahadev, Mora Mahadev, Munglyacha Mandir and the Goddess Kamlaja Devia Temple. The beauty around this lake is picture-perfect with the lush greenery. The mountains surrounding this place are all covered with forests, mostly of teak wood. There are also beautiful rings of tamarind trees and babul trees here. This is followed by an area completely devoid of all vegetation. The place is divided into five parts namely- outermost ejecta blanket, crater rim, slopes of the crater, crater basin including lake and the crater- lake. This is a beautiful place and a tourist hotspot but is continuously getting polluted due to the chemical discharges from the surrounding factories and industries. This is an ideal picnic spot. This is an ideal place for photography. Best time to visit is during the winter season. Do not dirty the lake surroundings. The nearest bus stop is the Vidyapith Bus stop. It’s best to drive out to here, or to hire a cab for a day. Lonar Meteor Address: Buldana, Aurangabad- 431001, Maharashtra, India. How popular is Lonar Meteor? People normally club together Balapur Fort and Ajanta Caves while planning their visit to Lonar Meteor. The only Crater lake in India. Nature's wonder. Salty water with very high pH. Scenic especially during evenings. Good MTDC resort overlooking the lake. One time definite visit. Great place to visit but while visiting make sure to follow right road to goto the main lake area. There are some people from local area which will guide you in the wrong direction. Purpose is not clear to me but might be big impact so take care for such cases. Absolutely amazing At the same time, it is so sad that there is not much awareness of the geological value of the site among the masses. It is a natural history event that happened way way before our forefathers were around. Please visit this place at least once in your life.